This article is about enemy bosses in the Mario franchise and all related series. For general enemies, see List of enemies. "BOSS" redirects here. For information about a level also known as "BOSS", see Donkey Kong (level). Mini-bosses (a.k.a. mid-bosses or sub-bosses) - Bosses that are sometimes found in the middle of a level, world, or chapter, and are usually just upgraded versions of a normal enemy. An example of a mini-boss is Boom Boom. Recurring bosses - Bosses that are fought over and over again. An example of a recurring boss is Jr. Troopa. Chapter bosses - Bosses that appear in RPGs at the end of a chapter. An example of a chapter boss is Tutankoopa. World bosses - Bosses that are fought at the end of a world. An example of a world boss is Lemmy. Final bosses - Bosses that are fought mostly near the end of a game, and are supposed to be the hardest boss fought in the entire game. Once the final boss or bosses have been defeated, the game is usually finished. However, there have been times when the game does not immediately end, and the player may need to complete an extra task first (for example, in Mario & Luigi: Superstar Saga). An example of a final boss is Bowser. The boss fought directly before the final boss is a penultimate boss. Optional bosses - Bosses that are most often found in RPGs. They exist in the game, but they do not need to be defeated for the player to beat the game. Sometimes, optional bosses are even harder to defeat than final bosses, as is the case with Culex, The Master, and Bonetail. 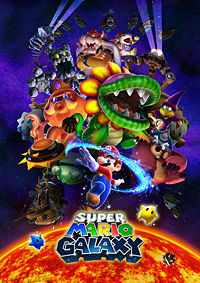 The list includes all bosses that appear in the Mario franchise and related series, with the first game in which they appeared as a boss next to their name. Final bosses appear in bold and optional bosses appear in italics. Arich – Donkey Kong Country 3: Dixie Kong's Double Trouble! Barbos – Donkey Kong Country 3: Dixie Kong's Double Trouble! Belcha – Donkey Kong Country 3: Dixie Kong's Double Trouble! Bleak – Donkey Kong Country 3: Dixie Kong's Double Trouble! Bloomsday – Wario Land: Shake It! Blooper – Super Mario Bros.
Cheepskipper – New Super Mario Bros.
Chortlebot – Wario Land: Shake It! Cup King – Wario Blast: Featuring Bomberman! Dry Bowser – New Super Mario Bros.
Gururin Knight – Wario Blast: Featuring Bomberman! Hot Roderick – Wario Land: Shake It! KAOS – Donkey Kong Country 3: Dixie Kong's Double Trouble! Kroctopus – Donkey Kong Country 3: Dixie Kong's Double Trouble! Lakithunder – New Super Mario Bros.
Large Fry – Wario Land: Shake It! Mad-Bomber – Wario Blast: Featuring Bomberman! Mario – Donkey Kong Jr.
Master Hand – Super Smash Bros.
Mega Goomba – New Super Mario Bros.
Metal Mario – Super Smash Bros.
Monty Tank – New Super Mario Bros.
Mummipokey – New Super Mario Bros.
P-Flower – Wario Blast: Featuring Bomberman! Pukupuku – Wario Blast: Featuring Bomberman! Rollanratl – Wario Land: Shake It! Shake King – Wario Land: Shake It! Squirt – Donkey Kong Country 3: Dixie Kong's Double Trouble! T-Bear – Wario Blast: Featuring Bomberman! Thunder Cloud – Wario Blast: Featuring Bomberman! Top Man – Wario Blast: Featuring Bomberman!